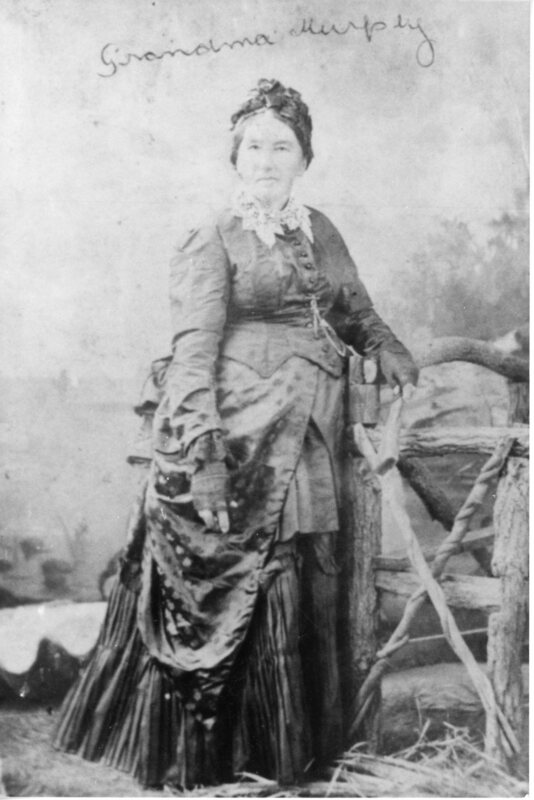 Mary Murphy (nee Cullen) the wife of Daniel Murphy arrived early on the Gympie Goldfield in 1867. She had come in search of her youngest son who had left for the Gympie gold field with his school boy mates. Not receiving any news of him, she became so anxious she resolved to go and find him. Times were hard for the family of ten. They had emigrated from Wexford, Ireland initially settling in Sydney prior to coming to Queensland where Daniel was employed on Moonara Station. Mary bought a hotel in Fortitude Valley in Brisbane after Daniel was injured and unable to work. The colony was in the midst of a great depression, treasury was bankrupt, the Queensland Bank had closed and no public works were in progress. The police had warned businesses to close early in fear of the navvies helping themselves. News of a rich gold field to the north, discovered by James Nash, saw a mass exodus to the new gold field. Mary, a resourceful woman, left the family behind and travelled with her daughter and other women going to join their husbands on the field. She found her son Daniel who was proud of his claim and was on fair gold. Enterprisingly, Mary was so impressed by the possibilities that she bought a good business site in the only street at the time and had a very comfortable building made of “ Hobart Town “ palings with big shutters for windows like a blacksmith shop and named it “ Murphy’s Travellers Rest Hotel”. What an amazing achievement for a woman to undertake in this era. She sent word for Daniel to sell out and bring the family to Gympie. Catherine the eldest daughter had been left behind to care for the younger children and her father. The first winter in Gympie was very cold and frequent visitors gathered around the big open bush fireplace in the kitchen. They were welcome to eat hot roasting potatoes and onions with hot bread and butter, as Mary kept an open larder, but had to pay for the drinkables. The young folk would gather around reciting poetry and singing. This was very enjoyable. Outdoors the crowds were very merry and musical. Sometimes there was fighting but it was rough and tumble and they were soon friends again. At days end, the diggers after satisfying their appetites would wash and dress and congregate in the streets and in various places of amusement, hotels, music halls, theatres and dancing halls that were in full swing every night. “Just imagine thousands of men of all nations and degrees, they were all the same in those days, a thoroughly democratic lot”. Mary’s children were to be intertwined with the early history of Gympie – “three of the Murphy sisters, daughters of an Irish boarding house keeper, must have been rather special because they all married prosperous men. Catherine married James Nash (discoverer of the Gympie gold field), Margaret married Emmanuel Gate (a French aristocrat) and Annie married Zachariah Skyring (a farmer who became a local legend) and Mrs W .T. (Walter Thomas) Barnes (a printer in East Brisbane). Another sister Alice Murphy, employed at Parish’s Hotel, Spring Hill, Brisbane, died suddenly of heart disease on 3/10/1897 and was buried in Gympie on 5/10/1897. Their brother Daniel Murphy, manager of the Great Eastern Mine died at the mine, (not from any accident but from rupture of the blood vessels to the lungs) on 11/1/1882 aged 27 years. Mary’s obituary of 3rd of January 1907 identifies that she had reached a ripe old age and had arrived on the gold field shortly after its discovery, and with her husband , who predeceased her many years earlier, carried on a business in Mary Street for some time.